PREMIER LEAGUE CHAMPIONS Manchester City face the prospect of a third Champions League group-phase exit in four years after a disastrous 2-1 loss at home to CSKA Moscow. CSKA claimed a first win on English soil at the sixth attempt after Seydou Doumbia scored either side of a free-kick by Yaya Toure, who was sent off in the second half along with team-mate Fernandinho. Fernandinho, a half-time substitute, was dismissed for two bookable offences and key midfielder Toure was red-carded for pushing Roman Eremenko in the face, leaving the home side with only nine men. Both players will miss City’s next game, at home to Bayern Munich on November 25, when if Manuel Pellegrini’s side fail to win and there is a victor in the other Group E game between CSKA and Roma in Moscow, they will be out. On a cold night in Manchester, City’s fans booed the Champions League anthem in protest after away supporters were prevented from watching the 2-2 draw between the teams in the reverse fixture two weeks ago. That game was played behind closed doors due to a punishment imposed on CSKA by UEFA for racist chanting by their supporters. City’s fans reacted angrily when they realised that a small band of CSKA supporters had made their way inside the Etihad despite being banned, chanting for their removal until police escorted the interlopers out. City made the worst possible start when Doumbia, who retired from international football earlier this year, escaped the attentions of former Ivory Coast team-mate Toure to head in Bebras Natcho’s right-wing free-kick in the second minute. Toure allowed his man to slip away from him all too easily, but the hulking midfielder atoned six minutes later when he swept a glorious 25-yard free-kick into the top-left corner after a foul on Stevan Jovetic. Visiting goalkeeper Igor Akinfeev twice saved from Sergio Aguero and once from Martin Demichelis as City attempted to assert control, but sloppiness at the back meant that the home side continued to look vulnerable. Doumbia gave them a scare when he ran onto Alan Dzagoev’s sumptuous through-ball before shooting narrowly wide, and City did not heed the warning. Eleven minutes before half-time, Gael Clichy played a blind, panicky clearance straight to Natcho, and the Israeli freed Doumbia to roll his second goal of the night past the exposed Joe Hart. Pellegrini had kept faith with the team that beat Manchester United 1-0 on Sunday, but he shook things up at half-time, introducing Samir Nasri and Fernandinho for Jovetic and Jesus Navas. City began to force CSKA back, James Milner curling in a cross that narrowly eluded Aguero and then forcing Akinfeev to save with his legs. But with 20 minutes to play they lost Fernandinho, who was shown a second yellow card for blocking off Ahmed Musa, only eight minutes after he had been booked for fouling Dzagoev. From the ensuing free-kick, Georgi Milanov curled narrowly wide. City were given reason to feel aggrieved when Pontus Wernbloom, who had already been booked, held Aguero back, only for referee Tasos Sidiropoulos to book Sergei Ignashevich in an apparent case of mistaken identity. Toure was shown a straight red card for a petulant shove to the face of Eremenko, and to add insult to injury, Aguero was booked for diving and then saw a strong penalty appeal turned down in stoppage time. Email “Yaya Toure curled in the perfect free-kick, but was sent off as City lost to CSKA”. 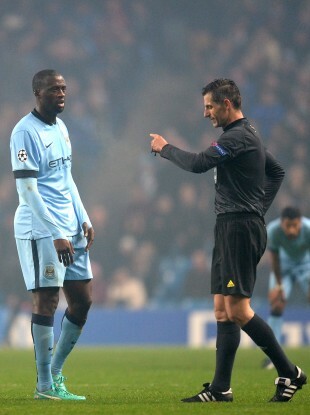 Feedback on “Yaya Toure curled in the perfect free-kick, but was sent off as City lost to CSKA”.